Tapping into trending news is part of what keeps web content relevant and real for readers. Newsjacking is simply taking newsworthy events and piggybacking your content to capture (hopefully) some of the search traffic. Ultimately, this can help increase your site views, as well as sales or profits. However, when done poorly, newsjacking can make you a jerk. News isn’t just fiction that’s out there on the internet—this is real life for real people. Not respecting the integrity of the news you’re co-opting for your own purposes is a recipe for offending your readers. If people have lost their lives or been hurt, be careful, and be respectful. Offer condolences, insight, and connections, but write as though the families of those hurt or lost might be reading it. Product tie-ins with recently deceased celebrities are a terrible no-no. You can and should get creative here, but keep the relationships as logical and linear as possible. If you run a website that sells shoes, then it’s a fairly thin connection to write about the latest peace treaty signed out of the UN. Rescue workers wearing your brand’s shoes during a harrowing natural disaster could, however, be completely be related. Contrived connections are not relatable to audiences and feel exploitative. Everyone loses when you co-opt someone else’s ideas. If it’s not original to you, then you’re being a jerk by taking it from someone else who was actually creative. However, you can be inspired by it. Go grab a cup of coffee, and come up with your own cool spin on the news. If an issue is controversial, even if you have deep personal feelings about it, it’s best to steer clear. You will offend potential customers no matter which side you take, no matter how crystal clear and popular it might seem to be. Offer something new to readers, not just the same facts and details they can read in the major news outlets. Newsjacking is about capitalizing on the trending news, not re-reporting it. For example, you can explore leadership and marketing skills utilized during the 2016 election. Give readers some insight that only you can provide. Newsjacking only works if it actually pulls things back to your brand and your message. You might be able to attract readers to your page by jumping onto hot news topics, but you won’t be able to keep them on your site unless your perspective relates to your product offerings. It’s acceptable to embed your message into a news piece—just be open about it! Readers respect transparency; they don’t want to feel as though you’re trying to get one over on them. Link to your products, talk about your industry, connect with previous content. Don’t use gimmicks to sell your product, as it only serves to turn people off. What’s news today will not be news in three weeks. If a story is trending, jump on it. Revisiting older stories that no longer are top news feels stale and doesn’t serve your purpose well at all. Newsjacking can offer some wonderfully fresh and innovative content for websites that are interested in taking their work to the next level. These topics are already trending, interesting, and fresh. When newsjacking is done right, it can boost traffic and, eventually, sales. When it’s done wrong, you end up looking like a spoiled corporate jerk. 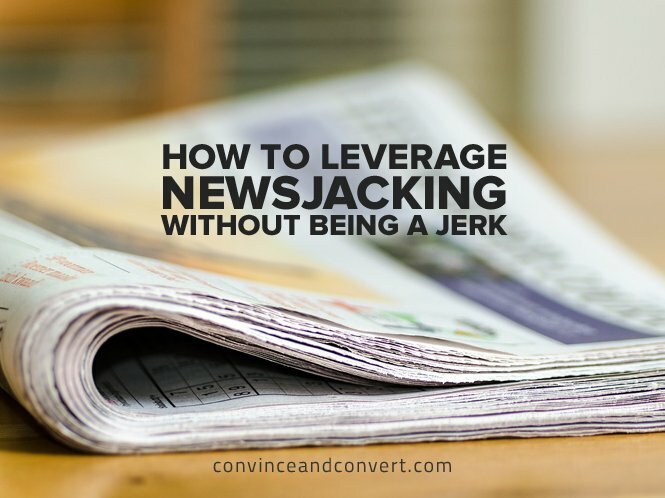 So go ahead and newsjack—but do it carefully.